This Fair Trade-produced, hand-crafted game is a unique way for young children to learn their alphabet! 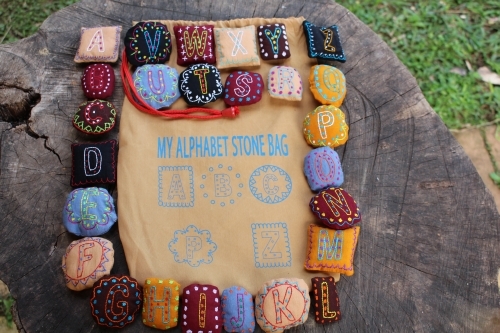 Each small padded 'stone' has a letter hand-embroidered on one side, ideal for children who benefit from hands-on learning. A wonderful addition to an Indigenous-inspired learning centre! As this is a handmade product, colours may vary slightly to those pictured, but the quality will remain the same. Scholastic is proud to support Fair Trade practice — the artisans who produce these wonderful products are specialists in their field, be it embroidery, hand stitching or screen printing. They work as part of a 'collaborative operative', which enables them to better control their working conditions. A percentage of the profits goes directly towards building and maintaining schools in their communities and ensures their children have uniforms, books and paid school fees.